The wildly popular holiday show returns, bringing the swing to the holidays. This all-star tribute gives you the best of the ’30s and ’40s Big Band era. 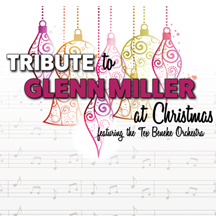 Combining famous favorites like “Little Brown Jug” and “Tuxedo Junction” with holiday classics, The Tex Beneke Orchestra will sweep you along in the spirit of the season. The Modernaires (“Chattanooga Choo Choo”) and vocalist Leigh Vance join bandleader Gary Tole for a joyful trip down memory lane.